Gerald Ford was the 38th President of the United States of America, the symbolic leader of the country. His presidency began in 1974 and ended in 1977. He was 61 years old when he first began his term of office on August 9, 1974. His birth name was actually Leslie Lynch King, after his biological father. He was renamed after his adoptive father, Gerald Rudolph Ford, who he believed to be his real father till he was 17. He signed his name as 'Jerry Ford' in informal cards and letters. His nickname Mr. Nice Guy was due to his clean-cut and non-partisan image. The nickname of Accidental President is a reference to his entry to the presidency following the demise and resignation of President Richard Nixon. 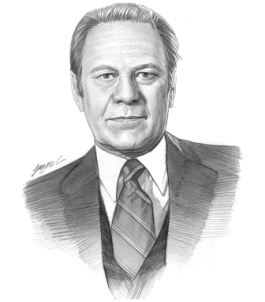 The picture of Gerald Ford portrays an interesting image of what this famous man looked like. The picture shows the clothing and the hairstyle that was fashionable during his presidency. He is described as being slim, athletic and muscular, 6 feet in height and 190 pounds in weight. He has small, blue colored eyes and his hair was blond that turned slightly gray with age. He has a prominent, squishy nose and fair complexion. He has a bright smile that displayed his straight white teeth when he laughed. He was a stylish dresser and favored sporty clothes that complemented his athletic build. Character and Personality Traits: What was Gerald Ford like? The personality of Gerald Ford is described as extrovert, genial, considerate and friendly. He was direct approach, liked by many and disliked by few. His nickname Mr. Nice Guy was due to his clean-cut, friendly and non-partisan image. The important role and duties of the President of the United States of America include those of Chief of State, Chief Diplomat, Chief Executive, Commander in Chief, Legislative Leader and Leader of his own political party. What was Gerald Ford famous for? Why was Gerald Ford important? The history and life of President Gerald Ford during his presidency is conveyed in the following fact file in an easy question and answer format. What President was Gerald Ford? He was the 38th President of the United States of America. The dates of his presidency began in 1974 and ended in 1977 (August 9, 1974 to January 20, 1977). What other political offices did Gerald Ford hold before his presidency? What was Gerald Ford' nickname? His most famous nickname was "Mr. Nice Guy"
Who was Gerald Ford' s first lady? Gerald Ford was famous for the events and accomplishments of his presidency, but what are the facts about the man and his private life. Facts and information about the private life of Gerald Ford can be found in the following fact file in an easy question and answer format. When and where was Gerald Ford born? Where was Gerald Ford educated and what was his religion? What did Gerald Ford do before he became President of the United States? Who was Gerald Ford' wife and when did they marry? Did they have kids? When did Gerald Ford die? We hope that the picture, facts and information on President Gerald Ford will prove helpful to kids, school children and schools learning about the presidency of this famous American leader. The facts about Gerald Ford provides an overview of the President's character and personality traits. Watch the video and learn more about the major events of his life and his accomplishments. The following Gerald Ford video is a useful educational resource for kids, children and schools learning about the life of the US President Gerald Ford.